In a seminar held at CERN today, the ATLAS and CMS experiments presented the status of their searches for the Standard Model Higgs boson. Their results are based on the analysis of considerably more data than those presented at the summer conferences, sufficient to make significant progress in the search for the Higgs boson, but not enough to make any conclusive statement on the existence or non-existence of the elusive Higgs. The main conclusion is that the Standard Model Higgs boson, if it exists, is most likely to have a mass constrained to the range 116-130 GeV by the ATLAS experiment, and 115-127 GeV by CMS. Tantalising hints have been seen by both experiments in this mass region, but these are not yet strong enough to claim a discovery. Taken individually, none of these excesses is any more statistically significant than rolling a die and coming up with two sixes in a row. What is interesting is that there are multiple independent measurements pointing to the region of 124 to 126 GeV. It's far too early to say whether ATLAS and CMS have discovered the Higgs boson, but these updated results are generating a lot of interest in the particle physics community. "We have restricted the most likely mass region for the Higgs boson to 116-130 GeV, and over the last few weeks we have started to see an intriguing excess of events in the mass range around 125 GeV," explained ATLAS experiment spokesperson Fabiola Gianotti. "This excess may be due to a fluctuation, but it could also be something more interesting. We cannot conclude anything at this stage. We need more study and more data. 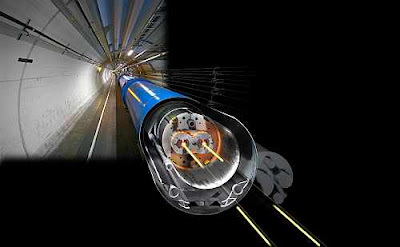 Given the outstanding performance of the LHC this year, we will not need to wait long for enough data and can look forward to resolving this puzzle in 2012." "We cannot exclude the presence of the Standard Model Higgs between 115 and 127 GeV because of a modest excess of events in this mass region that appears, quite consistently, in five independent channels," explained CMS experiment Spokesperson, Guido Tonelli. "The excess is most compatible with a Standard Model Higgs in the vicinity of 124 GeV and below but the statistical significance is not large enough to say anything conclusive. As of today what we see is consistent either with a background fluctuation or with the presence of the boson. Refined analyses and additional data delivered in 2012 by this magnificent machine will definitely give an answer." A Standard Model Higgs boson would confirm a theory first put forward in the 1960s, but there are other possible forms the Higgs boson could take, linked to theories that go beyond the Standard Model. A Standard Model Higgs could still point the way to new physics, through subtleties in its behaviour that would only emerge after studying a large number of Higgs particle decays. A non-Standard Model Higgs, currently beyond the reach of the LHC experiments with data so far recorded, would immediately open the door to new physics, whereas the absence of a Standard Model Higgs would point strongly to new physics at the LHC's full design energy, set to be achieved after 2014. Whether ATLAS and CMS show over the coming months that the Standard Model Higgs boson exists or not, the LHC programme is opening the way to new physics.